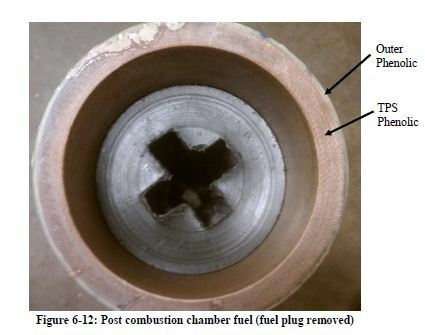 During the Fall 2012 semester, we were having quite a few problems getting the fuel to cure properly and we weren’t sure why it was happening. After a few sample casts, we were able to get a full cast and cure that would work. While we eventually were able to get the process to work, we wanted to have a more dependable cast-and-cure process. This was one of the early focuses for the fuel team this semester (Spring 2013). After doing a couple more sample casts, we found a method that seemed to work better. We started mixing the components of the fuel with a mixing drill rather than relying on a person to mix it properly with a paint stick. As we learned this semester, the mixing process is crucial to a successful fuel grain. Model of the fuel grain, TPS, and the injection system assembled. Bottom of the fuel grain as well as the TPS. 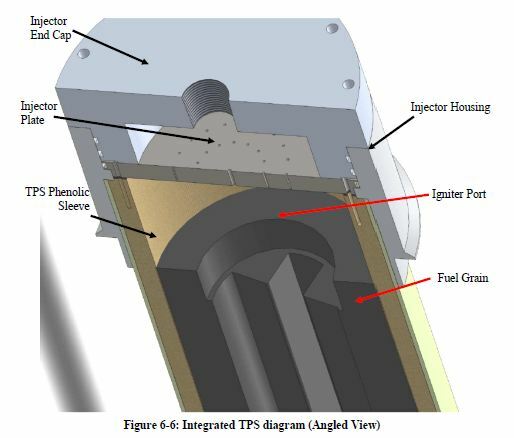 Because of the STF 4 failure, our Thermal Protection System (TPS) is still untested. One of the issues that we are faced with is that, currently, we have no way of testing the TPS without doing a static test fire. If the test fails as it did in the fall, we can still not say that the TPS is verified. The only way to have it verified is if our rocket burns for the full expected time (around 30 s). With STF 5 right around the corner (mid-late March), there is no way for us to find a way to test the TPS separately. Hopefully this STF will be successful and thus verifying our TPS.